Work for Genie Backup Manager? Learning about Genie Backup Manager? "Easy to use decent backup manager"
Genie Backup Manager is an easy to use backup manager. It has an easy to use interface, and it's easy and fast to configure file level backups and set up schedules. There's a lot of configuration options and you can also set it to backup to Amazon cloud. 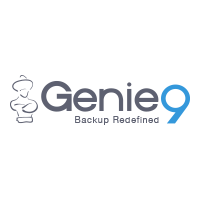 While the interface is pretty fresh, it feels like the functionality is somewhat outdated and Genie9 is focusing more on it's other suites of consumer backup solutions. While local backups works great, backing large amount of files to Amazon works really sluggishly. Genie backup manager also lacks a lot of enterprise features and is really mostly suited for the entrepreneur or small business user, who requires a cheap solution that works great locally. Make sure this fits your use case. There are many different solutions for different needs out there. This product is best if price is a major concern, and backing up locally on a schedule is what you need. There's still a place for local backup software, but use the trial and evaluate whether this suits your need. It's a cheap backup solution that we have used for employees working from home with large amount of assets, allowing them to configure their backup themselves. It's really mostly about price and ease of use, as there are far superior backup solutions out there. "Simple backup sw for file level backups"
We used Genie Backup Manager for making simple file level backups on workstations and while it lacks enterprise functionality it performed really well on the individual workstations. It has all the functionality you can expect from a consumer/soho backup product. It's very easy to set up and get started with. Scheduling and selecting files to backup works very smoothly. Restoring the backup is fast and powerful. You can get activity logs sent to you through emails. Lack of business support. They do have FAQS and articles however we lack access to a technical hotline or call-in number. It lacks full image backup capability. It cannot backup virtualized machines. It looks like Genie is shifting away from this product onto more consumer oriented products. The ability to restore from network locations did not work very well for us. We were unable to verify if it was just doe to our network locations or because the program fails at this aspect. Use it if you just need a file level backup, but don't expect any enterprise features. It also looks like Genie is shifting away from this type of backup product to a more consumer driven range. We needed a very cheap quick backup software for our coworkers working from home. We also needed something that was intuitive and fast to learn for our users. "Clean-cut UI & easy to use"
The UI of the program is very clean and easy to navigate through which makes planning and scheduling your backups a breeze. It is quite intuitive to use and would satisfy 95% of the consumers looking for a basic backup program out there. Because it stays clean and basic, it is missing some advanced functionality that could be beneficial for the more advanced user. If you're looking for a simple and clean solution for a backup program, this is the one to try. Full, incremental, and mirror backups are the main options where you can choose what items in a user's profile or directory to be backed up. At the enterprise level, this may be cutting it close, but as a no-frills consumer-grade solution, it's a great program to use. Scheduled backups for our users' important data and profiles with a no-frills backup program. * We monitor all Genie Backup Manager reviews to prevent fraudulent reviews and keep review quality high. We do not post reviews by company employees or direct competitors. Validated reviews require the user to submit a screenshot of the product containing their user ID, in order to verify a user is an actual user of the product. Hi there! Are you looking to implement a solution like Genie Backup Manager?